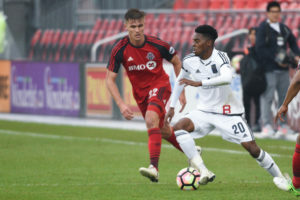 Bethlehem Steel FC have announced the signing of central defender Brandon Aubrey, formerly of Toronto FC who played last season for the club’s wholly- owned affiliate in the USL. Aubrey, 6’3″, 192 pounds, and 22 years old, started 20 games for Toronto FC II in 2017. He was Toronto’s first pick in the 2017 super draft, being taken 21st on the day. The first team declined his option after winning MLS Cup in December. He played for four years at Notre Dame prior to joining Toronto where he was part of the 2013 NCAA national champion. Aubrey’s signing continues this week’s theme of giving second chances to castoffs from other teams. A subtext of that theme is the quality of each player’s previous program and coaching. Knowing coach Burke, Brandon Allen (Monday), Omar Holness (Tuesday) and Aubrey have all been discussed carefully with their former coaches at both the first team and farm team levels. In the past Burke has stated his respect for John Wolyniec of Red Bulls 2 — Allen — and Jason Dent of Toronto FC 2 — Aubrey. We have not heard him discuss Mark Briggs of Real Monarchs. USL fans will recall that while Toronto FC II did not succeed in the table in 2017, they pulled some surprising upsets and by the end of the season were a much improved squad. Brandon Aubrey is the first addition to Bethlehem’s new central defense, the area on the pitch in most need of attention for 2018 after striker. He follows in the footsteps of 2016’s Mickey Daly and 2017’s Hugh Roberts as the USL veteran core defender. It is hoped the Steel will continue to add defenders from free agents, both professional and collegiate, and from the impending super draft. The USL roster stands currently at eight, and was required last season to be a minimum of twelve. The Steel carried thirteen in 2017, so more roster news should be forthcoming. The first rounds of the 2018 Super Draft are next Friday, January 19, and the following rounds are Monday the 21st. Currently, the Union have no picks in rounds 1 and 2, and hold overall picks 54, 55 and 77 in rounds 3 and 4 on Monday. It is not unreasonable to think some of those three may end up with the Steel. Um this is The Steel. A perfectly good place for this strategy. I know, I guess it’s just a general malaise. Great one, and Sieve! And everyone else. This comment is massively premature, but i’m Going with it anyway. Look up the Union academy u-15s on the,Development,Academy website. Get to the,roster nd look,at the stats. Then look at the schedule for Saturday, March 3rd. They are in Conshohocken to play FCContinental Delco. Might be fun to go take a look. I will try if everything else in life breaks properly. Thanks for the info, I think I may go take a look. It’s nice to know that at least Steel are making signings. This kid looks to have some good upside. Well done! The Union are now going to win the Cup. This signing upsets me to no end but not as much as the 9 signed (primarily because gol scoring is such a strange animal)…. and it isn’t the players fault. Welcome to the USL and making a go at a career after choosing college, I’m glad you received a degree. I’m glad you played for a perennial National power. I imagine you are a pretty good player. and now for the heat…. but to be in the way of a 17 or 18 year old kid hoping to make a professional pathway. I’m not buying. I simply have no idea what Union and Steel are trying to accomplish. Bethlehem serves two masters. FULL STOP. Development. and Win. Win. and Development. And I am holy unconvinced which master is more served. At first I loved the idea of an affiliate but now have trepidation about how it has been organized. Want a crack at an MLS career, I’m all for it as a 22 year old man….but this dude should be playing USL soccer for a team unaffiliated with an MLS feeder. Cincinnati. Indy 11. Rowdies. or lower. I will never be convinced otherwise. I agree with what you’re saying, but being under the ownership of an MLS team might be attractive to players who think if they get chances training/playing with the USL team, they’ll have eyes on them from the first team coaching staff. Just a thought, but I think BSFC should have a few veteran guys to help work in the academy kids. While’s D2 (I think, they haven’t updated USL’s status), it’s still a professional league.